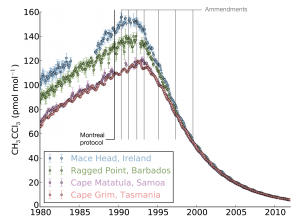 Concentrations of methyl chloroform, a substance banned under the Montreal Protocol, measured at four AGAGE stations. “I work on an experiment that began when the Bee Gees’ Stayin’ Alive was at the top of the charts. The project is called AGAGE, the Advanced Global Atmospheric Gases Experiment, and I’m here in Boston, Massachusetts celebrating its 35-year anniversary. AGAGE began life in 1978 as the Atmospheric Lifetimes Experiment, ALE, and has been making high-frequency, high-precision measurements of atmospheric trace gases ever since. At the time of its inception, the world had suddenly become aware of the potential dangers associated with CFCs (chlorofluorocarbons). What were previously thought to be harmless refrigerants and aerosol propellants were found to have a damaging influence on stratospheric ozone, which protects us from harmful ultraviolet radiation. The discovery of this ozone-depletion process was made by Mario Molina and F. Sherwood Rowland, for which they, and Paul Crutzen, won the Nobel Prize in Chemistry in 1995. However, Molina and Rowland were not sure how long CFCs would persist in the atmosphere, and so ALE, under the leadership of Prof. Ron Prinn (MIT) and collaborators around the world, was devised to test whether we’d be burdened with CFCs in our atmosphere for years, decades or centuries. ALE monitored the concentration of CFCs, and other ozone depleting substances, at five sites chosen for their relatively “unpolluted” air (including the west coast of Ireland station which is now run by Prof. Simon O’Doherty here at the University of Bristol). 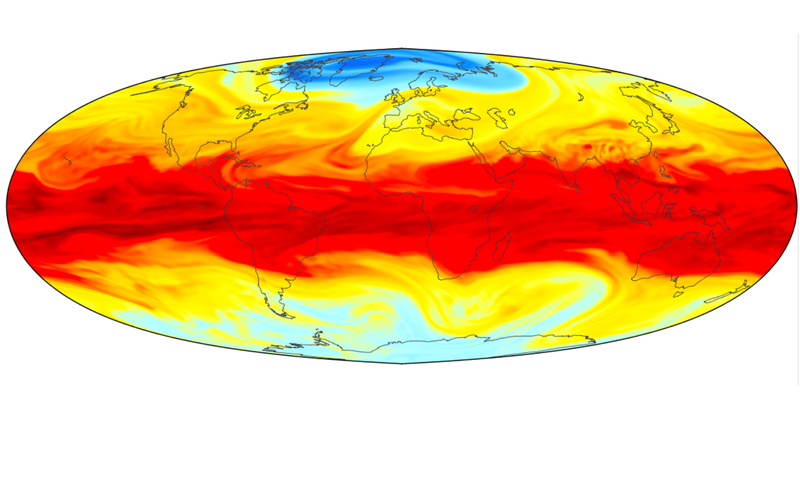 The idea was that if we could measure the increasing concentration of these gases in the air, then, when combined with estimates of the global emission rate, we would be able to determine how rapidly natural processes in the atmosphere were removing them. Thanks in part to these measurements, we now know that CFCs will only be removed from the atmosphere over tens to hundreds of years, meaning that the recovery of stratospheric ozone and the famous ozone “hole” will take several generations. However, over the years, ALE, and now AGAGE, have identified a more positive story relating to atmospheric CFCs: the effectiveness of international agreements to limit gas emissions. The Montreal Protocol on Substances that Deplete the Ozone Layer was agreed upon after the problems associated with CFCs were recognised. It was agreed that CFC use would be phased-out in developed countries first, and developing countries after a delay of a few years. The effects were seen very rapidly. 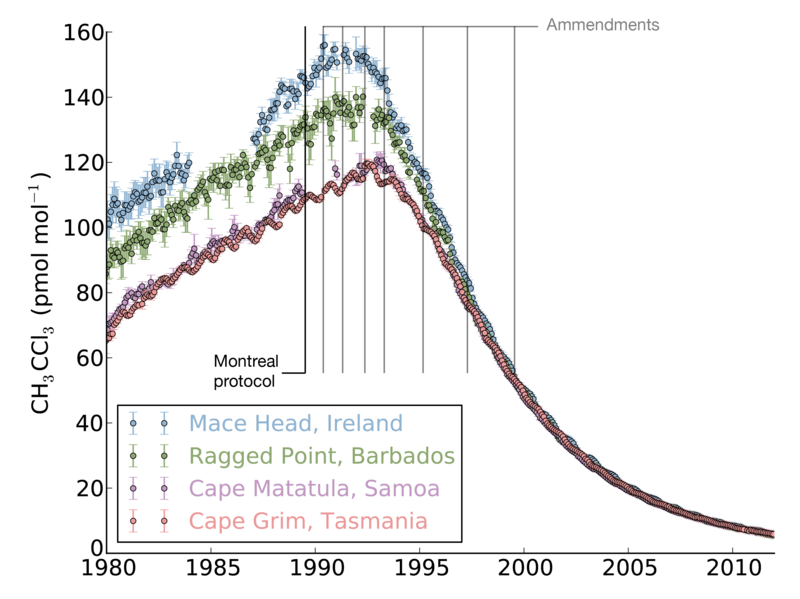 For some of the shorter-lived compounds, such as methyl chloroform (shown in the figure), AGAGE measurements show that global concentrations began to drop within 5 years of the 1987 ratification of the Protocol. Over time, the focus of AGAGE has shifted. As the most severe consequences of stratospheric ozone depletion look like they’ve been avoided, we’re now more acutely aware of the impact of “greenhouse” gases on the Earth’s climate. In response, AGAGE has developed new techniques that can measure over 40 compounds that are warming the surface of the planet. These measurements are showing some remarkable things, such as the rapid growth of HFCs, which are replacements for CFCs that have an unfortunate global-warming side effect, or the strange fluctuations in atmospheric methane concentrations, which looked like they’d plateaued in 1999, but are now growing rapidly again. Previous PostPrevious GAUGE kicks off!